Scientific Name: Krameria triandra Ruiz et Pav. Rhatany is an undemanding shrub. 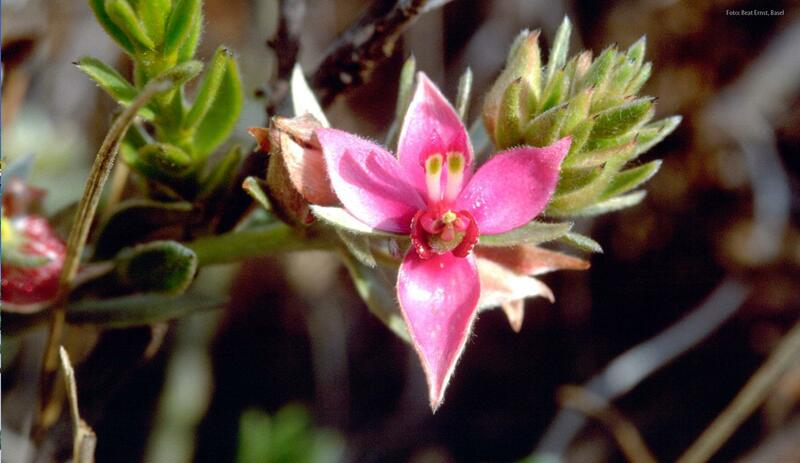 In its native habitat high in the Andes it grows on barren sandy slopes, reaching a height of up to one metre. Its branches are covered in little hairs and are procumbent rather than erect, growing outwards along the ground. In order to survive in this inhospitable landscape rhatany draws water and nutrients from other plants. It is not particularly selective, but uses diverse plant species as host. This is called hemiparasitism, because rhatany carries out some photosynthesis and is only partly dependent on the host plant. Rhatany branches bear yellowish-white, downy, pointed, oblong-ovate leaves about one centimetre in length. Its flowers, which grow from the leaf axils, have four petals which are red on the inside and have grey hairs on the outside. These petals frame three striking-looking stamens. The unusual thing about the flowers is that they do not produce nectar to attract insects. Instead they produce an odourless oil in special glands called elaiophores. Bees of the genus Centris are specialised in the gathering of this oil, which they collect as food for their young and in doing so pollinate the flowers. The flowers give way to long, prickly fruits that are spread by means of their burr-like hairs which attach themselves to the fur of passing animals. The many-branched, wide-spreading rootstock is reddish-brown in colour. The part used is the rhatany root, which is rich in tannins. Root preparations possess astringent qualities and the neolignans also inhibit the proliferation of bacteria and fungi. Rhatany is useful in the treatment of inflammation of the mucous membranes of the mouth and throat and the gastrointestinal system, and for diarrhoea. In mouth care preparations it is often combined with tincture of myrrh. The name rhatany comes from the Peruvian Quechua language and means something like “plant that crawls over the ground” – an apt description of its growth pattern. The generic name Krameria is from the same source as the family name Krameriaceae. It was given to the plant by the Swedish botanist Pehr Löfling (1729-1756), a student of Carl von Linné (1707-1778), who named it in honour of Johann Georg Heinrich Kramer, a military physician in the Hungarian camp of Prince Eugene of Savoy (1663-1736). Kramer’s life work includes the book “Medicina castrensis”, published in 1735, in which he described “Bewährte Artzney wider die im Feld und Guarnisons unter Soldaten grassirende Kranckheiten” [Tried and trusted medicine for diseases prevailing among soldiers in the field and in the garrison]. The scientific epithet ‘triandra’ is composed of the Latin tri = three and Greek andros = man, and refers to the three male reproductive organs, the stamens, in the middle of the rhatany flower. practical experiments and once back in Spain he published this knowledge. The root bark releases a red dye on boiling which can be used to colour cotton and linen. It also imparts a red hue to lips, and in Portugal was formerly used to give colour to port wine. Although it is an undemanding plant, rhatany cannot be cultivated. For this reason rhatany root is always collected from wild shrubs. To avoid endangering stocks collectors are careful to spread new seed each time they dig up a root. In Dr.Hauschka Med Sage Mouthwash, rhatany works with tormentil and myrrh to strengthen and firm the gums.